Club member Alyce Van Patten awards the Young Women in Public Affairs scholarship to Sarah Del Vecchio. Anne Rasch telling us about all of Candaisy’s accomplishments — it wasn’t a short list! 2014 YWPA Scholarship winner Our YWPA Scholarship winner was Candaisy Crawford, a senior at Webster Thomas High School. She is described by her teacher and basketball coach as bright, diligent and affable. 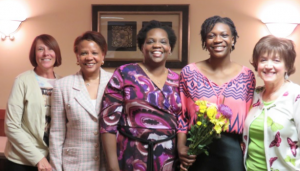 Candaisy learned the value of community involvement through her service to others. From the time she was a young child, she has accompanied her mother visiting the sick, serving meals at church funerals, cleaning homes for the elderly and disabled. Candaisy became acquainted with multi-cultural diversity when her home became a global melting pot for therapeutic foster teens who were hard to place. The Zonta Club of Rochester participates in Zonta International’s Young Women in Public Affairs Award. Since the program’s inception in 1990, Zonta International has given 601 awards to 534 young women, ages 16-19, from 50 countries. The Young Women in Public Affairs (YWPA) Award recognizes young women for their demonstrated leadership skills and commitment to public service and civic causes and encourages them to continue their participation in public and political life. 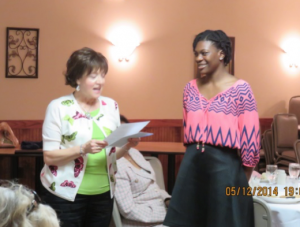 Over the last several years, the Zonta Club of Rochester has given four awards to local high school seniors. For more information, please contact our Scholarship Chair.